Have you ever forgotten a baby bottle at the bottom of the diaper bag or back of the car and now it reeks of sour milk? Does the odor continue to linger no matter how many times you clean the bottle? What can you do to salvage this smelly bottle and avoid buying yet another one? Foul smelling baby bottles don’t usually pose a health threat, but can often create an unpleasant taste. They also require extra steps to return the bottle to normal. But how do you get the awful smell out of your baby’s bottles without using a bunch of harsh chemicals? In this post, we will discuss how you can prevent those funky smells from developing and what steps to take if your baby’s bottles smell like soap, sour milk, burnt plastic, bleach, plastic, and formula. How Can I Prevent Bottle Odors? 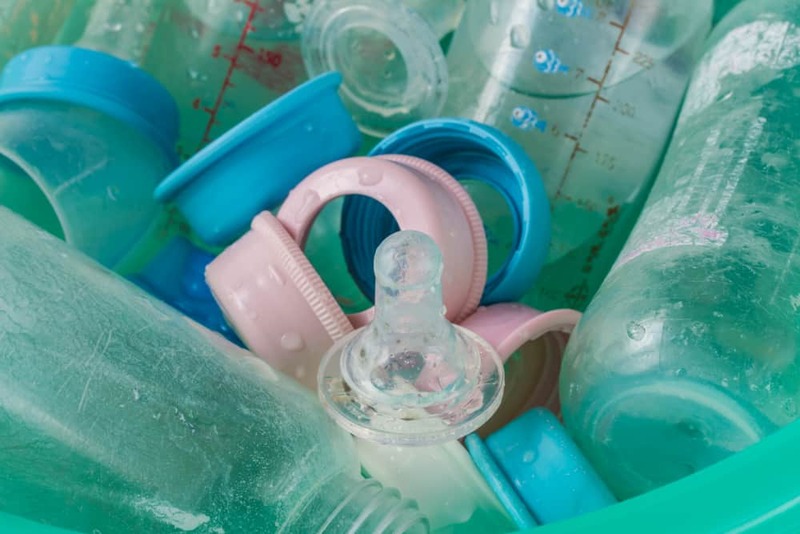 Your baby’s bottles go through a lot, so they’re bound to start to stink at some point, especially if you’re using plastic. Here are some precautionary tips you can follow to minimize the need to deodorize your bottles. Rinse immediately: Rinse your baby bottles immediately after each feeding, to prevent milk residue which may sour or grow bacteria. Proper cleaning: Proper cleaning will prevent the formation of bacteria in your baby’s bottles. So use hot, soapy water and get all those nooks and crannies with a bottle brush. Store bottles in the fridge: Bacteria may be the culprit of your baby bottle odors, so store your bottles in the fridge to slow bacteria growth. Bottles left to sit at room temperatures, especially when damp or unwashed, are more likely to develop bacteria. Prepare bottles right before feeding: Prepare a fresh bottle right before each feeding to prevent harmful bacteria growth. Follow manufacturer’s instructions: Follow the manufacturer’s instructions for cleaning and sterilizing. Be sure your bottles are dishwasher safe before throwing them in, and if so, it’s best to use the top rack only. Proper storage: Remember to follow safe formula or breast milk storage guidelines. Freshly expressed breast milk should be discarded after four hours of sitting out at room temperature, and formula and re-heated breast milk should be discarded after one hour at room temperature. Try glass bottles: Plastic readily absorbs odors, so it might be a good idea to give glass a try. If your baby bottles smell like soap, follow these cleaning tips and consider if the smell might be your breast milk. Try a different dish soap: Look for dish soaps free & clear, 100% food grade, or specifically made for washing baby bottles. Hand-wash: Try hand-washing if you’ve been using the dishwasher. Rinse thoroughly: Rinse thoroughly after washing with HOT water. Boil/sanitize: Boil your baby’s bottles for ten minutes after washing or follow another approved sanitization method. If you’re breastfeeding, the soapy smell may not be soap at all. Some breastfeeding moms can have excess lipase in their pumped milk which gives off that soapy smell, especially after refrigerating or freezing. If the smell is from excess lipase and not soap, your milk is perfectly safe to feed to your baby. However, some babies don’t like the taste and will refuse the bottle. You can scald newly expressed breast milk before freezing it to inactivate the lipase, but this process is time-consuming. It may also destroy some of the anti-infective properties of the milk and lower some nutrient levels. However, this is not likely to be an issue unless all the milk your baby receives has been scalded (source). Clean with baking soda: After washing your bottles and removing all milk residue, place two TBSP of baking soda in each bottle and fill with hot water. Shake for two minutes. Let sit for four to six hours, then rinse thoroughly with warm water. Do a vinegar soak: Vinegar is a natural deodorizer strong enough to cut through the fats in formula and breast milk. To do a vinegar soak, place a small tub or dishpan inside your sink and fill it with 50 percent hot water and 50 percent white vinegar. Take apart all your baby’s sour smelling bottles and let them soak for at least four to six hours, preferably overnight. After the soak, wash with hot water and dish soap and rinse thoroughly. I recommend doing the soak in a separate container other than your sink because most sinks are loaded with bacteria. Sterilize: After washing, sterilize your baby bottles and all accompanying parts to remove any leftover odors and bacteria. Put the washed bottle in the freezer: Place your baby’s bottle in the freezer overnight, and the cold temperatures will freeze the bacteria and remove odors. Test your breast milk: Smell and taste your breast milk before placing in the bottle to be sure it isn’t the culprit. If it’s distinctly sour or rancid, it’s best to pour it out and re-evaluate your storage procedures. Check for melts: Check all bottles and parts for any melted plastic. Dispose of any with melts, as many substances in burnt plastic are carcinogenic and negatively affect the lungs, skin, and immune system (source). Soak in vinegar: Soak any burnt-smelling bottles and parts in a tub/bowl filled with half vinegar and half warm water. Let soak for four to six hours or overnight. Re-wash: Re-wash and rinse thoroughly after completing a vinegar soak. Boil: Boil clean bottles and parts on the stovetop to sterilize and reduce odors. Toss them: If the smell of plastic persists, it’s best to toss your bottles and buy new ones. Was your baby sick recently and so you sterilized everything with bleach, but now can’t seem to get the smell out of your baby’s bottles? Follow these tips to get that strong bleach smell out. Cold water soak: Soak your bottles and parts in cold water for a few hours. Wash Thoroughly: Re-wash all your bottles with hot, soapy water or run them through the dishwasher again. Extra rinse: Lots of extra rinses will help get all the bleach out of your baby bottles. Boil: Sterilize all your bottles and parts by boiling for ten minutes or following another recommended sanitization method. Baking soda soak: Add four tbsp. and a quart of hot water to a container and let your bottles and all of their parts soak overnight. Wash with hot soapy water following the soak and let air dry. Call the manufacturer: If your bottles still smell like chemical plastic after washing, sterilizing, and soaking in baking soda, contact the manufacturer. Tell them your concern and possibly get a replacement or a refund. Baking soda: After washing your bottles and clearing all milk residue, place two TBSP of baking soda in each bottle and fill with hot water. Shake for two minutes. Let sit for four to six hours, then rinse thoroughly with warm water. You can also soak your bottles in a container using four tbsp. of baking soda and a quart of hot water. Vinegar soak: Fill a container using equal parts white vinegar and hot water and let your bottles and all of its parts soak for at least four to six hours, preferably overnight. Wash and dry as you normally would following the soak. Activated charcoal: Take an activated charcoal briquette and crush it into a fine powder. Pour the powder into the bottle and fill with hot water. Seal the bottle shut and let sit for three to four days before pouring it out and washing like normal. Boil/sterilize: Sterilize all of your bottles and parts by boiling them for ten minutes or following another recommended sanitization method. Foul smelling bottles are no fun to deal with, but most are salvageable. The deodorizing tips in this article will help you remove soap, sour milk, burnt plastic, bleach, plastic, and formula smells for your baby bottles. Avoid having to deodorize your bottles by taking precautionary steps, such as cleaning and storing properly, rinsing immediately, storing bottles in the fridge, and even using glass bottles instead of plastic. Ever had to deal with some funky bottle smells? Share your experiences with us in the comments and let us know what deodorizing methods worked for you. Don’t forget to share this post with all of your bottle feeding friends.